The Brookings Institution is a nonprofit public policy organization based in Washington, DC that is consistently ranked as the most influential, most quoted and most trusted think tank. The research agenda and recommendations of Brookings’s experts are rooted in open-minded inquiry and its more than 200 scholars represent diverse points of view. The Brookings Institution aims to solve public policy issues through high-quality, independent research. While looking to advance itself and its scholars as industry thought-leaders, the think tank turned to Cision to help improve its communications workflow, conduct more targeted and specialized media outreach and gain actionable insights on campaign progress. The Brookings Institution strives to be a go-to resource for media on public policy issues. "To be that, we need to cut through the noise of an endless news cycle that changes so quickly and has so many voices involved," said Brennan Hoban, Communications Coordinator at the Brookings Institution. "Our position is that we are a reliable, unbiased and fact-based source for media and the general public." With Brookings scholars spread across numerous research programs and in multiple Brookings centers around the world, part of Hoban's job is to make sure the promotional requirements of each program are being met and that efforts aren't being duplicated. "We have research programs in India and Asia that have specific needs, and in Washington alone we have five centers with their own unique research," said Hoban. "We needed a way to consolidate our campaigns, keep our centers aware of each other's work, and provide a strong and unified brand voice for the institution." 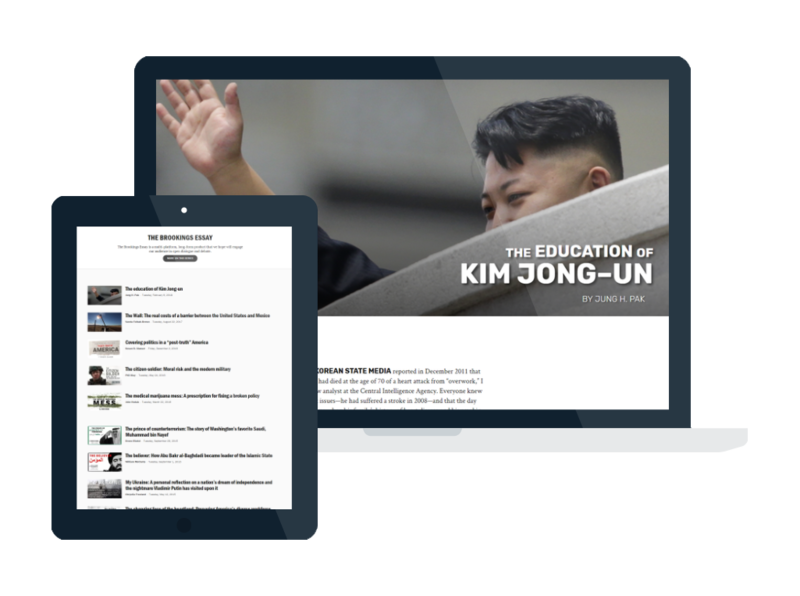 The Brookings Institution chose the Cision Communications Cloud® for its ability to identify key influencers, provide an environment in which to craft and distribute email pitch campaigns on multiple concurrent research projects, and attribute value to earned media efforts. Hoban and the team rely upon the Cision Database to build reporter lists that are categorized by subject matter and location. "Some Brookings centers used to host their media lists in Excel on their computers, which required manual updating and weren't accessible to the rest of the communications team," said Hoban. "With Cision, it's been much easier to build reporter lists that can be shared across teams and updated in real-time." Cision's email distribution capabilities removed communications silos by providing one place for the whole team to distribute press releases, send emails to influencers, and manage social posts. "We can format and personalize our outreach easily with Cision," added Hoban. "And the built-in email analytics let us test and track our success." The Brooking Institution is a heavy user of Cision's monitoring solutions, which help the team track scholars, projects, and centers. 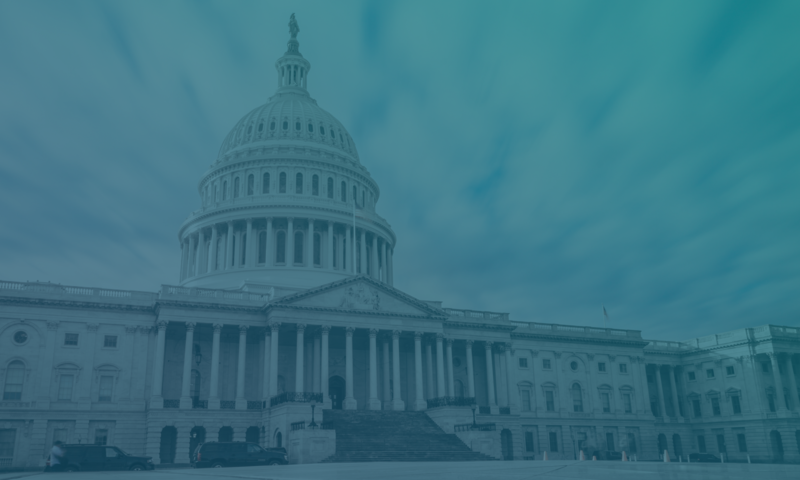 Cision enables the team to discover who they have reached with their earned media coverage, how their audience responded, what other outlets are saying and what public policy and current event issues are trending online. "We recently grew our analytics team, so we were excited to see what kind of data we could track and report on," said Hoban. "We've set up custom analytics searches to monitor scholar mentions, coverage about each center and all of our active programs." The team also subscribes to daily media alerts for timely notifications whenever scholars and projects are getting attention. More cohesive and coordinated campaigns: "Whenever we research a reporter inside Cision, we'll leave notes to each other about who last contacted them, the date of contact and how that interaction went," said Hoban. "Having everyone and their projects all in one place has been a game changer for us." Improved media outreach: Cision's Database of over 1.6 million contacts gives the think tank endless earned media opportunities. "We often know exactly what we want and with Cision, we can really narrow down our searches and find the right contacts easily," said Hoban. "We've pre-populated many media lists in the platform, so there's never a scramble to find the right list for new and upcoming projects." Having access to a reporter's specific beat and recent articles has proven to be a real time-saver. "Often an outlet's website doesn't list more than a name and photo. Cision gives us a lot of additional information beyond the email address," said Hoban. Easily identifiable trends: "The platform really helps us determine what issues are driving coverage and which outlets are driving our unique visitors per month," said Hoban. "It has helped us manage our media hits, especially since we get so many per day." The Brookings Institution has seen its media mentions grow consistently month-over-month. "Without these searches, this task would be impossible to find if we didn't have Cision," said Hoban. Not only can the team identify industry trends, but it's been able to effectively identify trends in its own coverage. "We're armed with the data to demonstrate high-performing research reports and what months our coverage spiked," said Hoban. 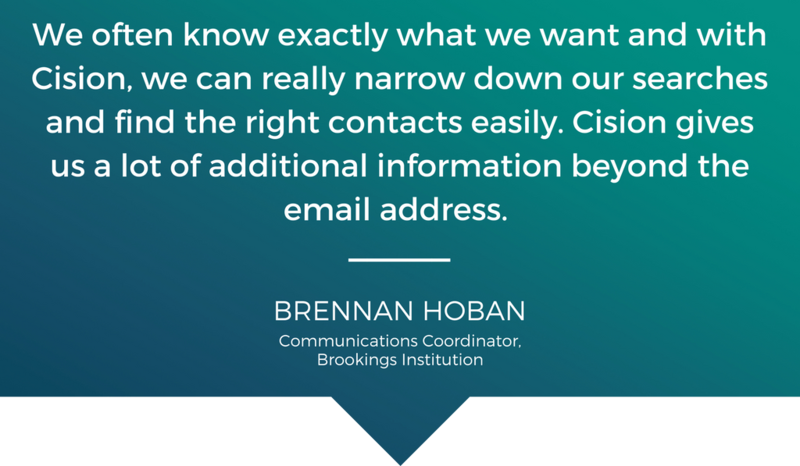 Testing earned media opportunities: Having the ability to send and receive reports on its email distribution through the Cision Comms Cloud, Brookings has been able to improve open rates and engagement by testing its content. "We learned that condensed email copy, promoting one targeted piece of content, and including our company name in the subject line led to higher open rates," said Hoban. "We also took note of reporters and outlets who read and engaged with our content, and ensured that they were included in future pitches and communications." Outside of the usual purpose for Cision Comms Cloud, the team was also able to use the platform to investigate the viability of partnering with third-party websites to re-publish its content. "Using Cision, we could look at the reach and potential audience of these smaller websites to help us make informed decisions about our content," said Hoban. Hoban hopes that more of its centers and teams will adopt Cision as their workflow platform of choice. "Our Brookings Essay project has been done manually with spreadsheets and Outlook. We want to push it all through Cision this time," said Hoban.